In the first pAsuram, AzhwAr says “You should mercifully ensure that I who have no refuge other than you, to reach your divine feet”. 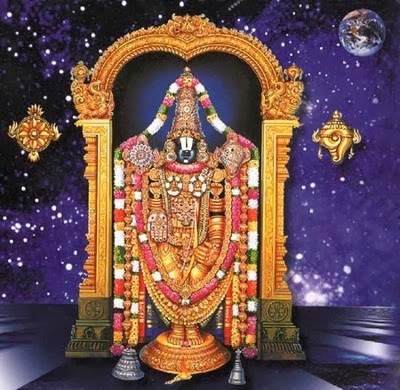 In the first pAsuram, AzhwAr says “You who are having the qualities to protect all the world and are present in thirumalA, should mercifully show the way to attain you to me who is having natural servitude towards you”. ulagam uNda peru vAyA ulappil kIrththi ammAnE! nilavum sudar sUzhoLi mUrththi nediyAy adiyEn AruyirE! perumAnE – Oh one who stood revealing your lordship! Oh emperumAn who is having divine lips/mouth which is the tool to protect the world with great eagerness [during deluge] by consuming it! Oh the one with endless glory and natural lordship! Oh one who is having divine form filled with divine splendour, revealing the complete radiance of natural beauty etc and having unbounded glory! Oh one who is being my perfectly complete vital air (life)! Oh one who stood revealing your lordship to me on thirumalA like a thilak which is applied on the forehead in the form of UrdhvapuNdram for the whole world! For me, the servitor who is coming in an ancient lineage, mercifully tell the means to attaining your divine feet! Would you only protect from the danger of deluge! Can you not protect from the danger of suffering in separation? Would you only protect when the whole world is suffering! Can you not protect if a single person is suffering? Would you only protect those who don’t realise the sorrow! Can you not protect the one who cried out in sorrow? Would you only rescue those who have no desire to be protected! Can you not rescue those who desire for protection? Would you only protect by placing in the stomach? Can you not protect by manifesting your form? Would you only protect those who you desire for! Can you not protect the one who desires you? Would you only protect with your mouth! Can you not protect by speaking a few comforting words? Would you protect by hiding all your endless qualities! Can you not protect by letting us enjoy those qualities? Would you only protect the world which does not know your relationship with it! Can you not protect the one who knows the relationship? Would you only protect the world which does not know the greatness of your form! Can you not protect the one who knows the greatness of your form? Would you only protect the world which does not know your greatness! Can you not protect those who know your greatness? Would you only protect those who sustain themselves in your separation from you? Can you not protect those who cannot sustain in separation? Would you only protect those who do not realise your simplicity! Can you not protect those who know your simplicity? Would you only protect those who are servitors of others! Can you not protect those who are exclusively serving you? Would you only protect those who have other refuge! Can you not protect those who have no refuge other than you? Would you only protect those who have ulterior goals [other benefits]! Can you not protect those who consider “service to you” as their only goal? Would you only protect those who want to separate from you! Can you not protect those who want to unite with you? Would you only perform great acts [like consuming the world] and protect! Can you not simply say “mA Sucha:” (do not grieve) and protect? ulagam uNda peru vAyA – Would the danger of ten deluges match my sorrow of not reaching the divine feet of your highness? Oh one who has more eagerness [to protect] than those who wish to be protected! Isn’t there a match between your eagerness and my agony? Aren’t you the one who protects based on the relationship and the danger alone! Would you only protect if the whole world is in danger! Would you not protect if I am inflicted with the same danger that affected the whole world? Would you only protect those who drowned in the ocean of deluge! Would you not protect those who are drowning in the ocean of samsAram (material realm) ? Would you only protect those who did not request you to do so! Would you not help those who request you to do so? Would you only protect when there is danger for the body! Would you not protect when there is danger for the soul? Would you only protect those who are caught in the deluge of water! Would you not help those who are caught in the deluge of separation? Would you only protect when endangered by others! Would you not protect when endangered by you? Is there any rule that you only protect those who have not surrendered! Would you not protect those who have surrendered? For you who cannot relax even after protecting someone, is it possible to not even think about protecting me? Aren’t you of the nature that even after protecting those who were caught in the danger of deluge, you will check with those who were present saying “is there anything great I have done for them?”, and subsequently will feel disturbed thinking “I have not done anything worthy for them” and feel dejected! peru vAyA – This is how the nature of the one who has more eagerness [to protect] than those who wish to be protected is. AzhwAr thinks emperumAn has the same amount of disregard for himself as the amount of eagerness in protecting the universe. peru vAyA – dhraupadhi said “SaraNam” (I take shelter of you) only once. Having that in his divine heart, he eliminated the insult that was to happen for her in the assembly, destroyed dhuryOdhana et al, crowned dharamaputhra, and had her hairlock tied [she vowed not to tie her hair until dhuryOdhana et al were killed]. Still being unsatisfied as said in mahAbhAratham udhyOga parvam 58.22 “ruNam pravruththam iva mE” (I feel like I owe you so much), while ascending to paramapadham, he departed with a wounded heart as said in “nAthis svastha manA:” (my heart is not in peace). ulappil kIrththi ammAnE – I am not praising him considering that his protection is an unnatural and occasional activity; this act of protecting the world and acquiring endless glory as a result of that is explained in thirunedundhANdagam 10 “pozhilEzhum kAval pUNda pugazh AnAy” (He has the glory of protecting the 7 worlds). Oh sarvESvara who is having glorious qualities! Your glory is not just advised as said in “thasya nAma mahathyaSa:” (paramAthmA’s glory is great), SrI rAmAyaNam kishkindhA kANdam 15.19 “yaSasaSchaikabAjanam” (He is the abode of glory), but is even popularly celebrated in the enemy’s camp as said in SrI rAmAyaNam sundhara kANdam 21.20 “vidhitha:” (he is well known)! Your commandment is such that the one which is tortured [sumukha, the snake] is well protected in the presence of the one who tortures [garuda, the eagle]! When he desires, the torturer will care for the tortured. nilavum sudar sUzh oLi mUrththi – Even if he is a butcher instead of a protector, his beautiful form will not let us leave him. nilavum – It is not something which he acquires based on some karma, and will lose it on exhausting of the same [i.e. it is eternal]. sudar sUzh oLi mUrththi – Instead of inside being dirt and outside being radiant, he is made of radiant material as said in SrIvishNu purANam 1.9.67 “thEjasAm rASimUrjitham” (collection of radiance);. He is said as in thiruvAimozhi 1.7.4 “uyarvinaiyE tharum oN sudark kaRRaiyai” (one who bestowed me increase in my knowledge, devotion, etc., and has a radiantly shining form). Unlike forms which are made of rajas (passion) and thamas (ignorance), his form is made of Sudhdha sathva (pure goodness), unlimited radiance, and like boiled ghee [which has a golden colour], full of luster both inside and outside. His divine form is explained both as “panchaSakthimayam” (made of five divine elements [which are different from the five elements which make material forms]) and “shAdguNya vigraham” (form having six auspicious qualities); but if analysed, his forms are made by five divine elements only; but when said as “shAdguNya vigraham“, that is because the divine form reveals those qualities unlike material forms which conceal the qualities. His forms are as explained in SrI rAmAyaNam sundhara kANdam 34.30 “rUpavAn subakaS SrImAn gandharpa ivamUrthimAn” (He is having divine form like cupid and having radiance) and in SrI bhAgavatham 10.32.2 “… thAsAmAvirabUth …” (He appeared amidst the cowherd girls like the cupid for cupids). nediyAy – Even if there is an end for the previously explained qualities, one cannot see the end for his qualities such as part-by-part beauty, wholesome beauty etc. As said in SrI rAmAyaNam kishkindhA kANdam 15.20 “mahAn” (the great), every aspect of his qualities is boundless. adiyEn Ar uyirE – Oh one who manifested your physical beauty and qualities and made me not sustain myself in separation! This should be read along with “thiruvEndaththemperumAnE” (lord of thiruvEngadam hill). thiladham ulagukkAy ninRa – Just as some women become complete with the thilak on their face, thirumalA is for the earth. adiyEn Ar uyirE – Oh one who arrived and stood in thirumalA, taught me my servitude towards you, and made me unsustainable without you! Until here, AzhwAr explained emperumAn‘s nature, and now he starts speaking about his own nature. kula thol adiyEn – I, who am a servitor, since long, along with all my ancestors. He is not highlighting his greatness, rather he is highlighting his lack of any other refuge. When one exists for only one person, no one else will protect that person. una pAdham kUdumARu kURAyE – As my nature is this, you kindly ensure that I attain the goal which fits my nature. adiyEn una pAdham kUdumARu – When a servitor wants to unite with you, it is expressed only as “uniting with your divine feet”. una pAdham kUdumARu – This is how AzhwAr‘s sAyujyam [the aspect of liberation, where one remains eternally united with the lord] is. kURAyE – Your one word leads to realising my true nature. When emperumAn speaks a single word, AzhwAr’s confusions will be eliminated. [AzhwAr is asking] You should say as in SrI bhagavath gIthA 18.66 “mA Sucha:” (do not grieve). This entry was posted in thiruvAimozhi, thiruvAimozhi 6th centum on June 14, 2018 by Sarathy Thothathri.